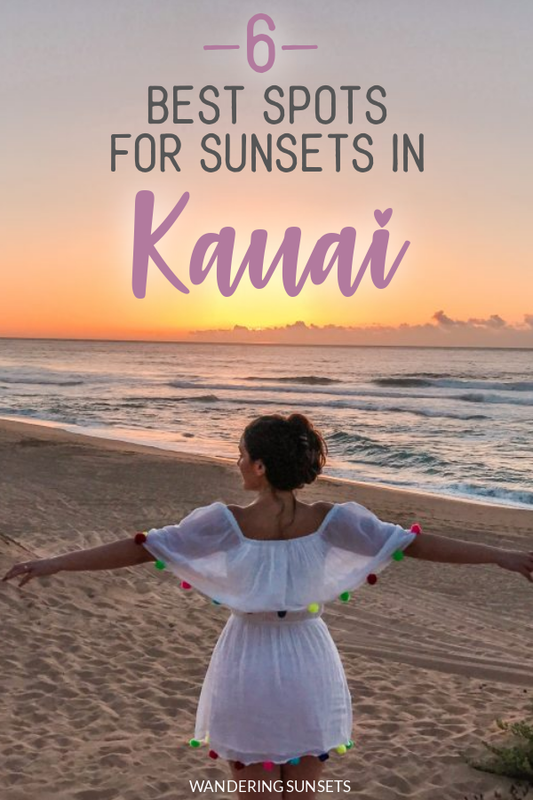 There is nothing quite like a sunset in Kauai… If you’re not familiar with the island, Kauai is an incredibly gorgeous Hawaian island with a very diverse landscape – from gorgeous beaches to lush forests and roaring waterfalls…Kauai never ceases to amaze. We visited at the end of May so this list will be more relevant for Spring and Summer, though I am sure there are some other incredible spots in the Winter. 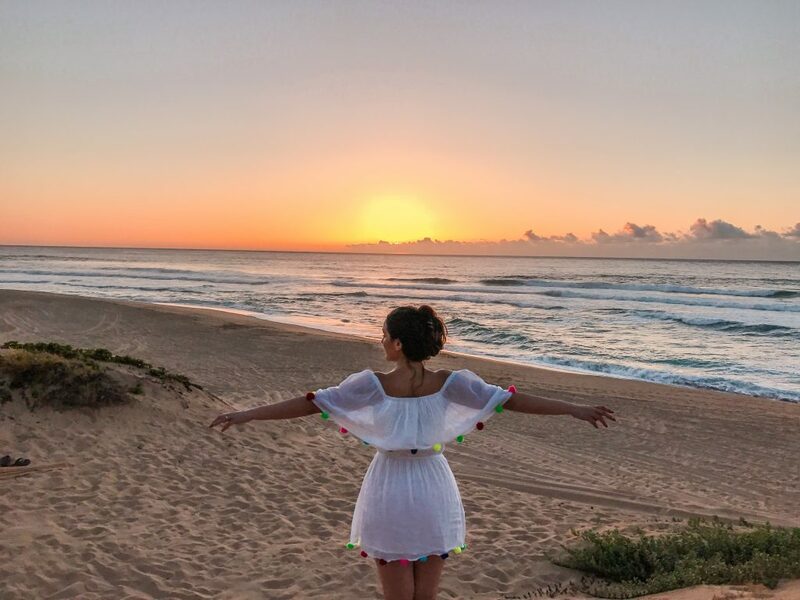 Here is out list of the most beautiful spots to watch sunset in Kauai. We stumbled onto this sunset spot on our way back to the Lihue airport at the very end of our stay on the island. It was one of those “stop the car and pull over immediately” moment…At this time of year the sun actually doesn’t set over the water on the East Coast which created some gorgeous pastel tones in the sky. Polihale Beach Park is the furthest you can drive on Kauai before the road ends and the Waimea Canyon begins. Polihale is a wild and remote beach, which can only be accessed after driving on a long dirt road full of rocks and potholes. 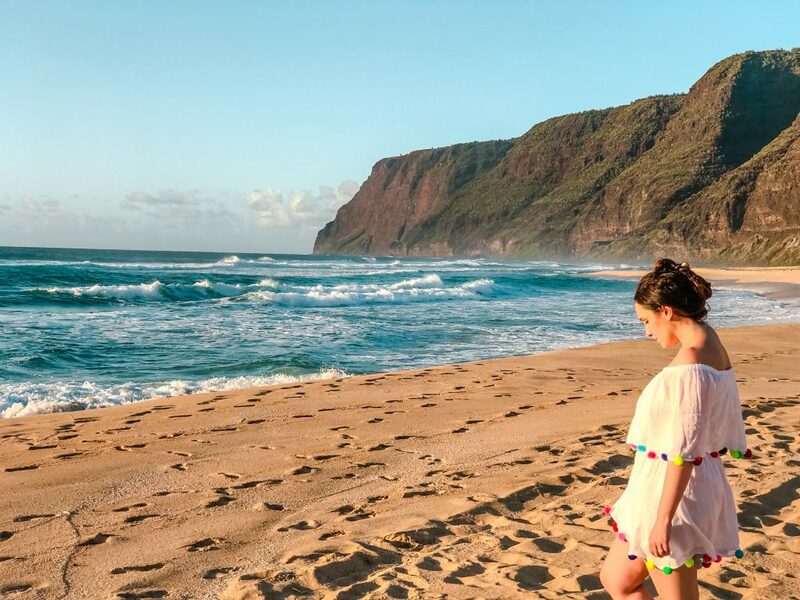 Very few tourists make it to Polihale so it is the perfect spot for a quiet sunset away from the crowds. We drove the dirt road to Polihale in our four wheel drive rental car. We saw a few people drive it in a regular car but I wouldn’t recommend it if you have a rental. Don’t attempt it if it’s been raining since the road will be very muddy and it might be hard to spot rocks and holes. Bring a picnic and a few beers. Watch the sand turn pink and the last light reflect on the canyon. Teal waves are crashing on the beach as the sun is setting on the horizon. 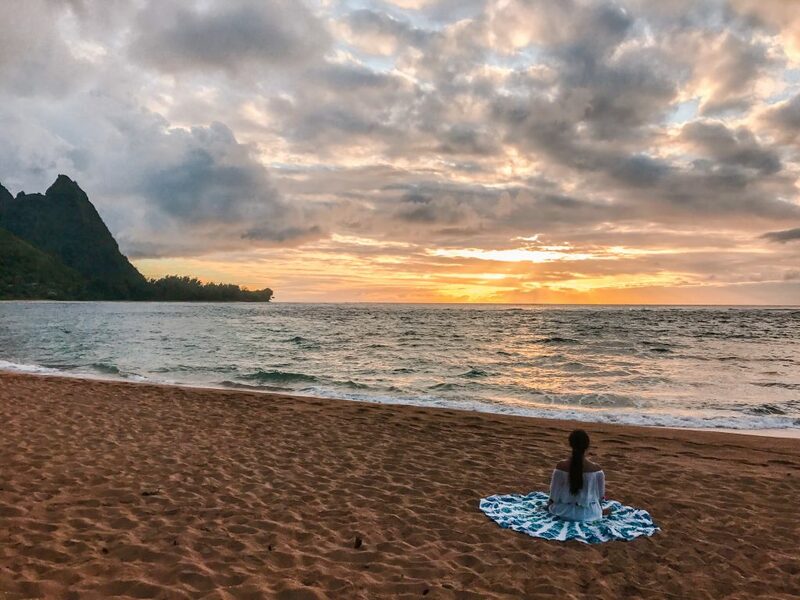 It’s totally magic, and one of the best spots to watch sunset on Kauai. Poipu is one of the most popular spots on Kauai since the beach is usually safe for swimming. Located on the south of the island, the cove is surrounded by palm trees which creates a beautiful arch for sunset. The black rocks on the sand and the deep orange colors from this angle make for a very dramatic sunset. Poipu is a very easily accessible beach, just a few minutes walk from the parking lot. It can get pretty busy on weekends but the further you walk towards the end of the beach the quieter it gets. 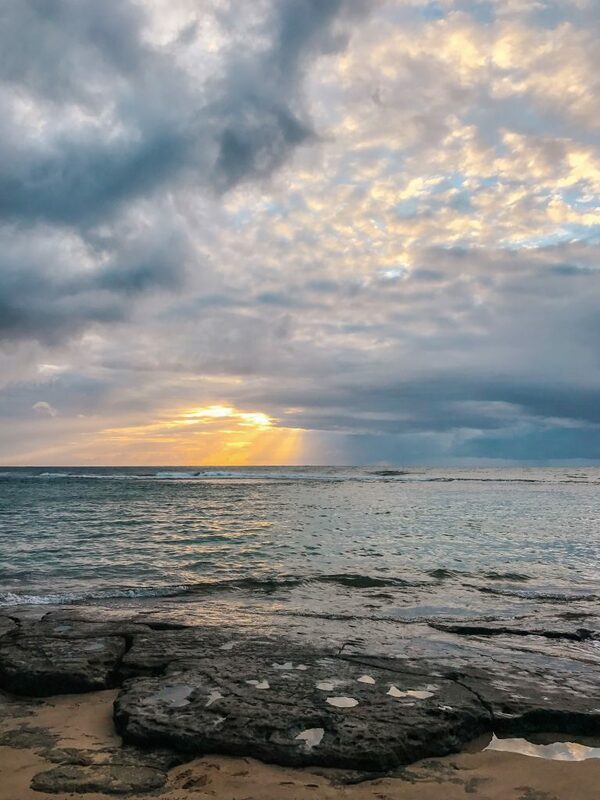 Poipu is an incredible spot to watch a Kauai sunset from the South of the island. Hanalei is located about a 10 minute drive from Princeville. A huge stretched of beach surrounded by mountains, and the most picture perfect dock. 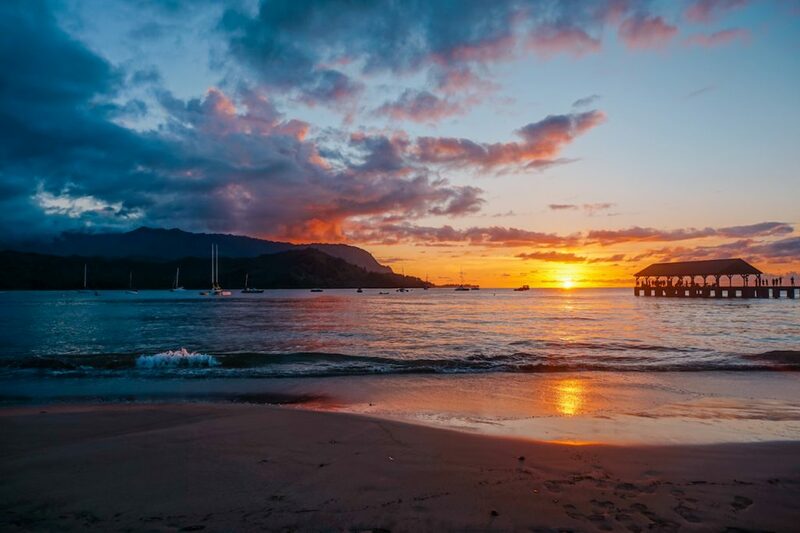 Hanalei is very close to the restaurants and bars in town and the most popular spot to watch sunset. Expect a bit of a crowd (and some bugs at night so bring bug spray) but it’s really worth it. A true Kauai sunset spot. Ke’e Beach is the furthest spot you can drive on the North shore of Kauai, all the way to the bottom of the canyon. Ke’e is pretty remote so you will leave most of the crowds behind. The flat black rocks make for some beautiful sunset reflections. Tunnels Beach is by far my favorite sunset spot in Kauai. I am not lying when I say that I left a little piece of my heart on Tunnels Beach. What makes this spot so special is that there is virtually no parking close by for non locals. To access the beach, you need to park your car on a side street about a mile away from the beach. During sunset time we were pretty much the only people there. The ocean is a deep teal color thanks to the biggest reef on the island of Kauai. The sky lights up with tones of coral and orange. The waves make the sand sparkle against a backdrop of mountains and waterfalls. 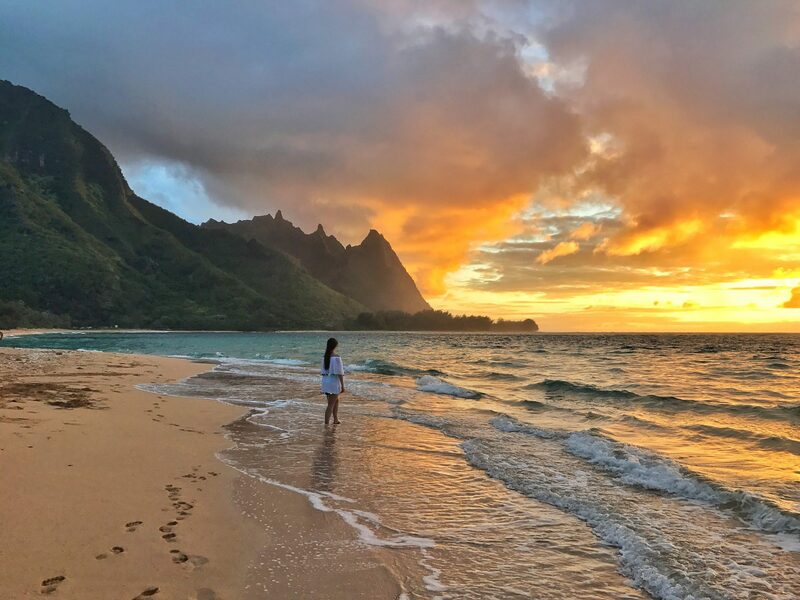 It was without a doubt one of the most beautiful sunsets we ever experienced… so if you visit Kauai don’t miss a Kauai sunset on Tunnels Beach. 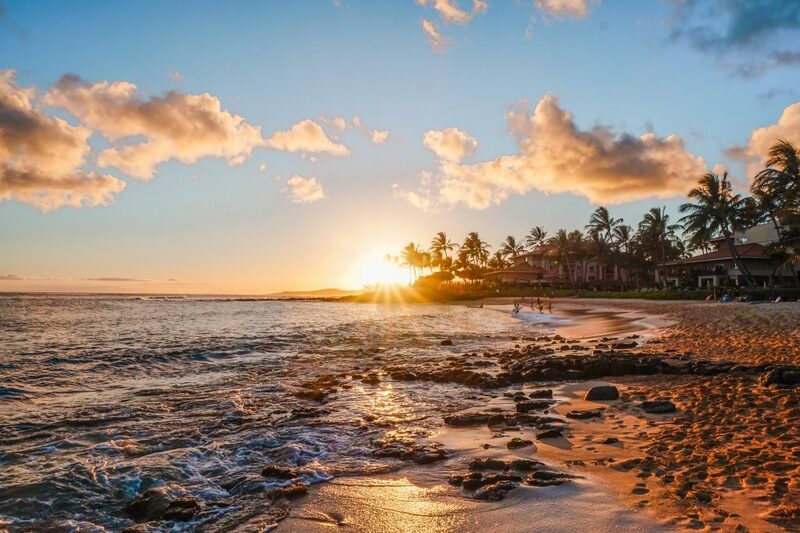 There are so many reasons to fall in love with Kauai, and one of them is that it is probably the only Hawaiian island that hasn’t been overrun by massive hotels and tons of tourists. 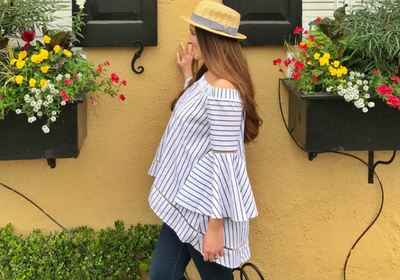 Read this post from Roads Best Traveled to see exactly what I mean. 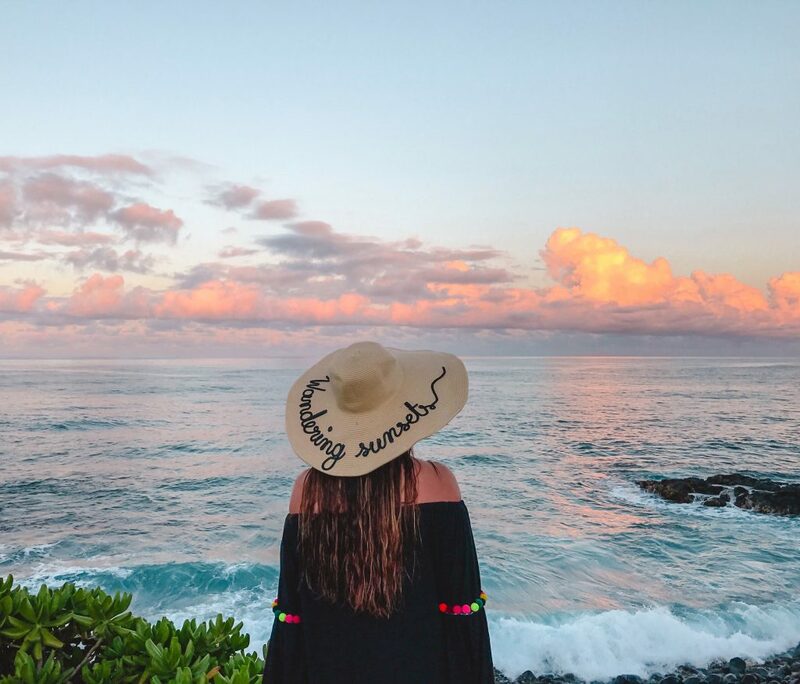 Aside from gorgeous sunsets, Kauai is full of adventures, beautiful hikes and delicious places to eat. You could be there for a month and never get bored. All of these sunset photos were edited using The Flyaway Girl’s Hawaii preset pack for Lightroom. Get yours to edit gorgeous sunset photos. These are some sick sunset pics! Oh, and I love your outfits, so cute! 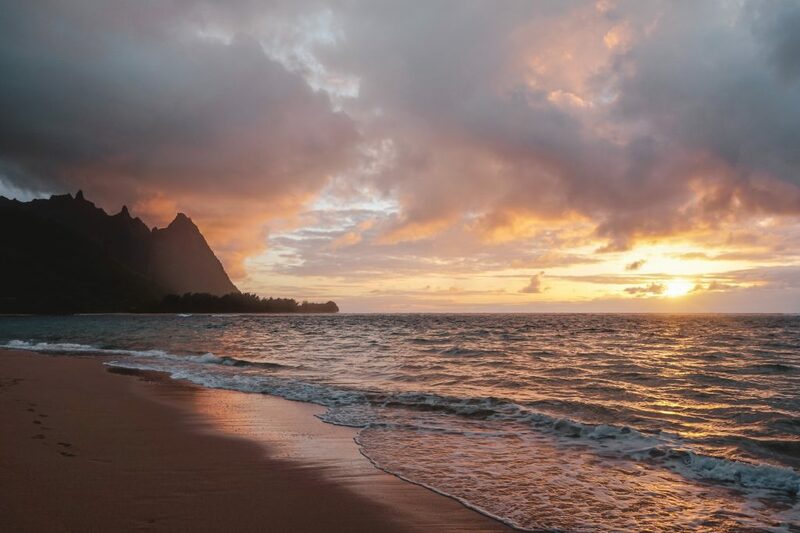 I remember these sunsets in Kauai, it was by far my favorite island in Hawaii! So many gorgeous spots! I visited Hawaii earlier this year but only had time for Oahu and The Big Island! Looks like I need to go back to see these! You would totally love Kauai! It looks so gorgeous! I need to go! What gorgeous photos. I think Hanalai Bay was my favourite! So I guess I need 6 nights minimum in Kauai to enjoy all these spots 🙂 I’m OK with that! Looks absolutely magical, thanks for this post. Julie, these photos are amazing! I still can’t believe Kauai is one of the only places I haven’t been to in Hawaii! 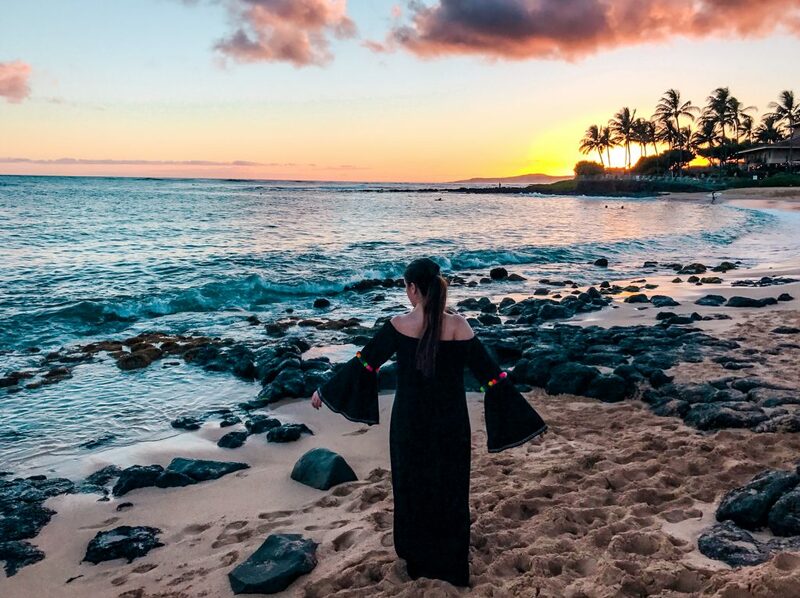 Amazing pictures, I so want to visit Kauai, I love your dresses as well! Wow, you really did find some amazing sunset spots. 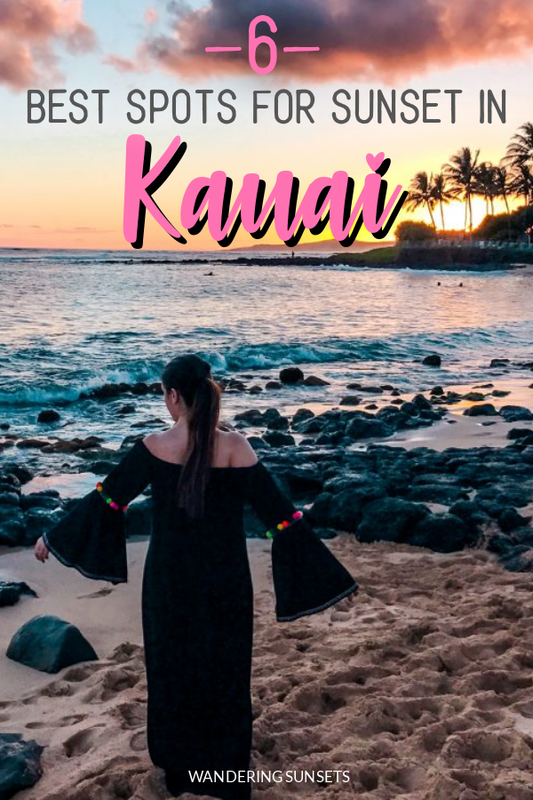 I’d love to check out Kauai- I’ve been to Maui and I really believe that the beaches and sunsets are just better in Hawaii! What stunning spots! I more of a sunrise gal myself, but with those views, I think I can do a few sunsets. I’ve heard so many great things about Kauai. How long would you recommend one go to that island for? Gorgeous photos, too! these all look amazing! Kauai is the one island I have not been to! I love your branded hat too! Where did you get that!?!??! I love Kauai! This reminds me I am long overdue for a visit. Hu Julie, thanks for the article. We are going to Kauai in 2 weeks and will follow your recommendations for sure! One silly question… when you walk back to your car from Tunnels beach, after sunset: is it easy to find your way back in the dark? Is the path clearly identified and is the hike easy?